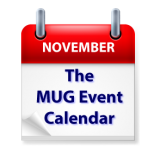 A super busy week is on tap for this week’s MUG Event Calendar. Bob “Dr. Mac” LeVitus is on his annual Mid-Atlantic MUG Tour, this year visiting groups in Virginia, New Jersey, and Pennsylvania. Adam and Tonya Engst will visit a New York group, and Apple’s Aaron Davis will address a Washington D.C. group. Lots of star power for those five groups, but there is much more. An FBI agent will talk cyber security at an Illinois group, a Carolina group will go paperless, and the Better Business Bureau will make an appearance in Alaska. Other topics for the week include photography, genealogy, and the Apple Pencil.